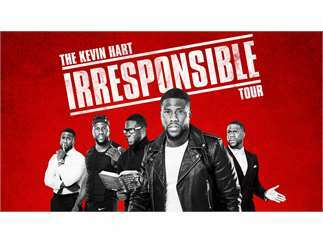 Kevin Hart will expand his widely successful and massively hysterical 'The Kevin Hart Irresponsible Tour,' adding over 100 new dates across the U.S., Canada, Europe, Australia and Asia including a performance at the Frank Erwin Center on Friday, Nov. 2. 2017 was a banner year for Hart, his memoir "I Can't Make This Up: Life Lessons" debuted at Number One on the New York Times Bestseller list and remained on the list for ten consecutive weeks. The book also topped records on the Audible platform, selling over 100,000 copies in the first five weeks. Earlier in the year Hart voiced a title character in "Captain Underpants: The First Epic Movie." To close 2017, Kevin appeared in the Sony reboot of the classic film "Jumanji "alongside Dwayne Johnson and Jack Black. "Jumanji" has been Kevin's highest grossing box office release to date, the movie has made over $800 million worldwide.